Adult Electric Scooter Review: OjO vs GenZe, Which One Works for You? Here at OjO Electric, we truly view the OjO Commuter Scooter, especially the Ford OjO, as the best on the market – the king of the jungle, so to speak. That doesn’t mean that there aren’t other contenders for its throne. There are so many different types of adult electric scooters around in addition to similar types of transportation (such as mopeds) that it’s hard to keep them all straight. A few have emerged from the pack though and one of these is the genZe scooter. The OjO scooter isn’t one to back down from a challenge, which is why we’d like to take the time to compare the differences between the two. genZe can reach up to 30 mph while OjO only goes up to 20 mph – which is the speed limit for bike lanes. genZe will go up to 30 miles per charge; OjO e-scooters can go 25 miles per charge. OjO scooters are bike lane friendly while genZe scooter aren’t so much – in many states you can’t ride a genZe (classified as a motorized bicycle) in the bike lane. OjO e-scooters feature digital dashboards with touchscreen technology; genZe scooters don’t. OjO has a Bluetooth-enabled sound system that genZe doesn’t have. 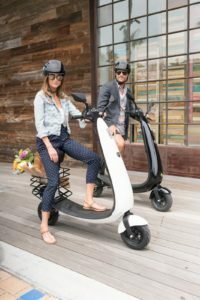 An OjO adult electric scooter only weighs 65 pounds while a genZe e-scooter weighs a whopping 232 pounds! OjO uses an ergonomic patented design that maximizes comfort while the genZe can be quite heavy and uncomfortable. If you’re impressed with what our OjO e-scooters can do and you’d like one of your own, we encourage you to buy an OjO off of our website. If you have any questions, comments, or concerns about our adult electric scooter, please contact us through our website or give us a call at (805) 991-7444 and we’ll be glad to help you however we can. We’re looking forward to hearing from you!